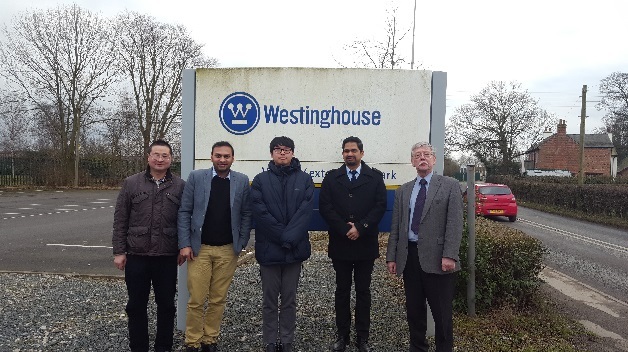 Some members of UCLan’s nuclear research team (Prof H Eccles, Dr Alistair Holdsworth, Mr Daniel Rowbotham, Mr Parthiv Kavi, Mr Sandeep Kadam, Dr Runjie Mao and Gyuhyeon Kim) visited Westinghouse Springfields Fuels Ltd. Following refreshments and an entertaining and informative presentation for the team’s tour guide they departed for the Oxide Fuel Complex. In this building the tour guide explained how enriched UF6 is converted to powder, pelletised and then sintered before inserting the pellets into stainless steel pins. The final stages included inspections, assembly into graphite sleeves and more inspection before the fuel assemblies were shipped to the customer. A brief comparison of Light water fuel manufacture and LWR assembly were also briefly described. Profs Bond and Eccles are most grateful to Sellafield Ltd, EDF and Westinghouse Springfield Fuels Ltd for their commitment and hospitality prior to and during these visits. Providing students and members of staff to see nuclear operations and hear of the safeguards and safety undertaken is a key feature of nuclear fuel cycle education.